Inspiration for a unique ring design can begin with the stones or from a ring that has already been made. The David Gross Group Yellow Sapphires in the 2 ring designs covered in this blog are particularly nice in color. Sapphires already have a natural brightness, and the nice polish on their stones really enhances their look. The stones demanded a lot out of the structure of the ring. The Sapphire was deep and the diamonds were long, so the under structure had to support the wide span and also look elegant and proportioned. The center stone dictated the depth of the center setting, while the span was dictated by the diamonds. The yellow stone was set in yellow gold to enhance the stone, and the same was done for the diamonds by setting them in 950 platinum. The customer wanted a squared off shank, so we put all these points together and created the ring. The sweep of the shank, the angles of the settings were arrived at with practice and an aesthetic eye. 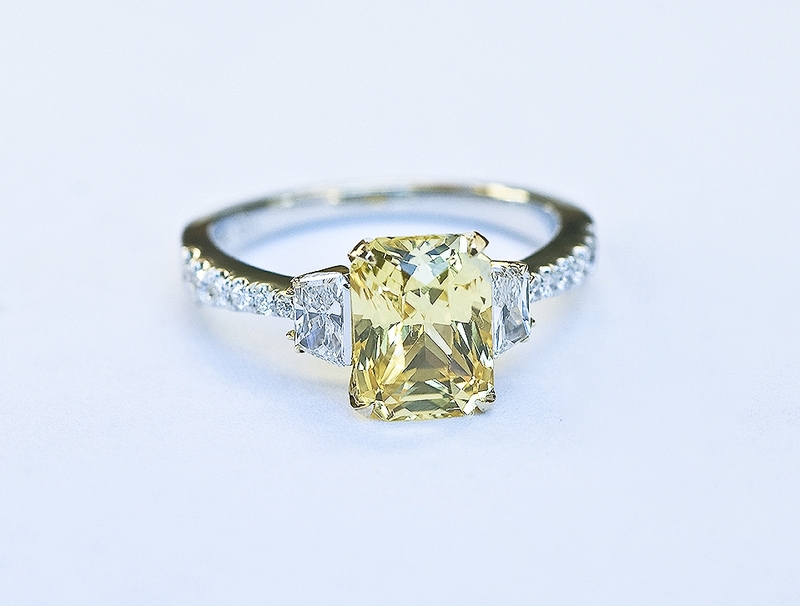 The next yellow sapphire ring was created using this first ring above as inspiration. Emerald cut stones look really elegant as engagement rings. They are enhanced by uniquely shaped diamonds that are mounted on either side, the shoulder stones. Yellow stones in particular have a cheerful visual effect. The color assigned to the intellect, they seem to brighten the mood, like a nice cup of green tea. When a design is first created, it sets off a cascade of stages that are inevitable. If you want a nicely polished and crisp edged finished ring it is important to have the design in a minimum of separate components in order to be able to get at the inside, and outside parts with hand polishing techniques. This separation happens naturally when there are different metals involved like in the yellow sapphire and white diamond combination. There is so much beauty in a finished ring. The high table in this yellow sapphire adds dimension and sparkle to the finished piece. There are a lot of different skills to draw from to pull off an engagement ring that has different metals, different shaped stones and a compact and elegant design. Here is a small introduction to the long and skilled process involved in creating an elegant engagement ring that lasts for generations because the materials are durable and the structure is sound. Handmade in Santa Barbara.